As VMGuru we are virtualizing all kind of business critical applications since 2005. Virtualizing Oracle Databases on vSphere is often part of those projects. I must express tho that none of us is an Oracle DBA, but we are often involved in virtualization projects were their is Oracle software present in the application stacks. Within such a project, one of the first steps is explaining how virtualization works and which benefits the organization and especially the DBAs get by virtualizing Oracle. Virtualizing database workloads on vSphere significantly reduces the number of physical systems your organization requires, while achieving more effective utilization of datacenter resources. DBAs wear many hats and play many roles within an organization. A DBA is the administrator who designs, implements, tests, operates, and maintains databases for an organization. When using the power of the vSphere platform, Oracle DBAs can maintain all process and techniques previously used but they should consider incorporation of the capabilities of virtualization into their strategy. You can deliver enhanced availability with VMware for Oracle databases. By doing so, it becomes much easier to implement a disaster recovery (DR) platform that enables production Oracle database VM servers to be recovered after failure. The following VMware capabilities are particularly valuable: vSphere High Availability (HA), VMware vCenter Site Recovery Manager (SRM), Rapid Provisioning new Database server environments with constant quality and consistency, vMotion and Storage vMotion for reducing planned downtime of Live Oracle servers, Distributed Resource Scheduler (DRS) guaranteeing resources in a shared environment. Today, VMs on vSphere 5.5 can scale to 64 virtual CPUs, 1TB of memory, and over 1,000,000 disk I/O per second (IOPS) per VM, while keeping overhead limited between 2% to 10% for the majority of performance metrics with the majority of applications. If that hurdle is successfully taken, the next one will be: OK we want to do it, but where do we begin and last but not least what will be the results? After everyone is enthusiastic and on-board, check that you have aligned the Business with IT. If you overlook the topics licensing and support you will experience an emergency stop somewhere during the project! Thanks to the people at VMware Press, did I get a copy of the book: Virtualizing Oracle Databases on vSphere for a book review. This book is written by Kannan Mani, a veteran when it comes to Oracle and placing it in an infrastructure. A domain expert in Oracle technologies on various platforms like storage and virtualization. And Don Sullivan, an Oracle Certified Master and also a long term veteran in the industry. A Systems Engineer Database Specialist and Oracle Solution Architect focused on the proposition of running Oracle, SQL and other high-workload systems on vSphere. 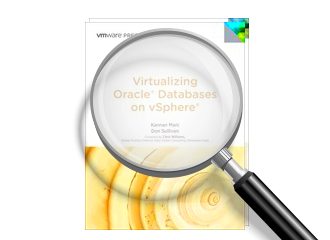 Why should you virtualize Oracle database on vSphere? How can and should you do it? What results will you get and how can you get the max out of it? Kannan Mani and Don Sullivan fully address architecture, performance, design, sizing, and high availability. Focusing on current versions of Oracle and vSphere, they highlight the differences between ESX/ESXi 4.x and 5.x wherever relevant. To deliver even more value, they provide extensive online resources, including easy-to-adapt scripts and expert how-to videos. They address the Why, How and What questions in depth from various angles. The value of virtualization goes far beyond basic consolidation. Virtualizing database applications on vSphere can improve application quality of service (QoS) and accelerate application lifecycles, reducing application costs. This book is for any DBA, Developer, vAdmin, (Project) Manager, License Consultant, IT professional or anyone who has responsibility for any part of an application stack that includes Oracle software. From the most junior administrator to the seasoned veteran, you will find something within this book to enhance your overall effectiveness as an IT professional. If you want to get the most out of your virtual infrastructure deployment, I recommend reading this book. The book is written in a conversational style and is very useful as fuel for a project team where business critical applications are being scanned, explored and/or targeted to be virtualized on a VMware vSphere infrastructure. I have been helping organizations, who are running Oracle, since 2005 to virtualize those workloads and get the best out of it. How great is it to see more enthusiast doing the same. And if you do it correctly it works flawlessly and makes Business Continuity, development (snapshotting, upgrading) a lot easier when Oracle is virtualized! From licensing, to architecture, keeping track of performance and sizing the workloads correctly to get the most out of it. Ever done migrations from one hardware platform to a new one? How many times did it cost and how many headaches did you have? I think the authors have done a great job, because the book is easy to read, highlights important points from various angles and also zooms in on different job roles. If you are going to be involved in virtualizing Oracle Databases on vSphere this is a book you should get for all team members to read! You can purchase the book from the Pearson/VMware Press Store.